As soon as I saw this Flower Power set from CC Designs I had to have it ... I love those cute monkeys! I have stamped the monkey out and coloured with Copics, cut out and added to base with DST. The base is simply a sheet of DB red CS followed by a sheet of DB 'Ladybug Picnic' paper. Ribbon wrapped around and tied in a bow. One of the new Prima Flower's from the e.line range added on top with a Pebbles Inc candy dot. I have left the greeting off as I think it can be used for many different occasions, when I know which I will add it in the bottom right corner! STAMPS: CC Designs. INK: Memento Tuxedo Black. CS: Craftwork Cards, Doodlebug Designs. ACCESSORIES: Ribbon by Ribbon Oasis, Prima E.Line Flower, Pebbles Inc Candy Dot, Copic Markers - E55, E57, G40, G82, Y11, Y15, C00, R27, B0000. Awww such a cutie Michelle!! He's just adorable! I love the fab paper behind and the ribbob and flower. Hi Michelle, Love all the cards you have been busy making. 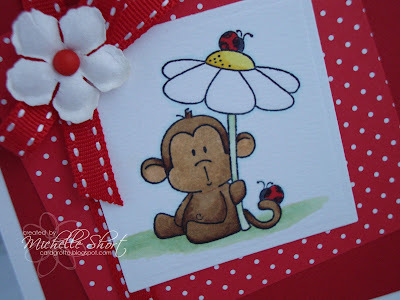 Love this little monkey card the red is stunning. Hope you are ok.
What a beautiful card Michelle,i love your image and papers. Love this Michelle! Gorgeous colour combo and fab little image! Another super stunning card Micelle and I am just loving the striking rich red paper too! 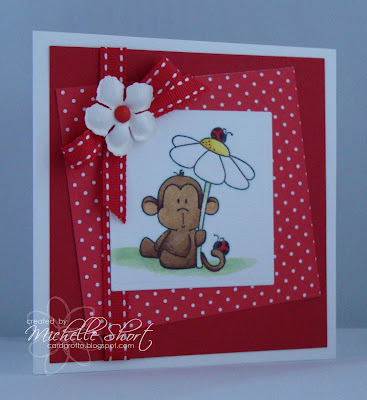 I love the way you've kept your card simple Michelle - really shows off that cute fella! What a fab card Michelle, such a sweet image and great colours! Naw, isn't he cute... :) I love that you don't pile things upon things on your cards, that they are kept clean and simple.